14 oz. of Sweet & Spicy Beef Jerky!! 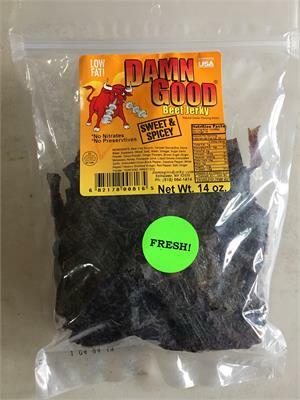 Damn Good Jerky > 14 oz. Fresh Bags > 14 oz. of Sweet & Spicy Beef Jerky!! Your taste buds will go crazy!!! I'm always in search for this brand of beef jerky...now I've found the website and can order on line. Life is good! 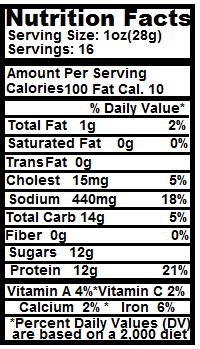 If you like sweet and if you like it to have a little kick, then this is the flavor for you. I am a fan of sweet and spicy. When I smoke ribs or brisket, I always make my bbq sauce with a sweet tone with some spiciness to it. My wife thinks it is a little too sweet so she doesn't snack on it for too long. This is pretty much the Hawaiian flavor plus some chili spice to kick it up a notch. I've had a bunch of all the other flavors (western, black pepper, teriyaki, hawaiian, garlic, hot and spicy) and I like this one the best. Has a good balance between sweet, salt, and spice. Best flavor out the bunch hands down !! !